The SDU-5000 series offers unique and practical method of controlling pressure or vacuum electronically. 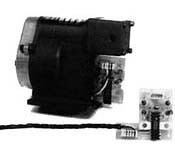 This is accomplished by interfacing a stepping motor and gear box to a modified 800 or 900 series subminiature regulators. A calibration report included with every unit provides a detailed test data including a scale factor that corresponds to a slope that will yield a open loop accuracy including linearity, repeatability and hysteresis, of < +/- 3% FS. The unit can also be interfaced with Airtrols 4103/4104 series spring biased comparators. Also available are the EVB-5000 Evaluation board, and SDB-5000 Interface board. 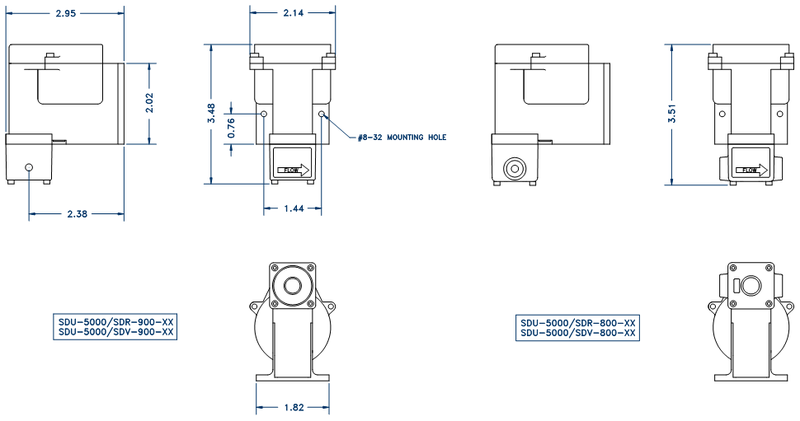 Note: R-810 Series regulators are not recommended for dead-end, no flow applications. A downstream relief of at least 20 cc/min. is recommended. EFFECT OF SUPPLY VARIATION < 0.1 PSI (0.69 kPa) per 5 PSI (34.5 kPa) supply change. Note: R-820 Series regulators have “near zero” bleed to atmosphere under normal operating conditions. Should any overshoot, or downstream pressure increases occur, the unit will relieve only what is necessary to stabilize the pressure setting. Important: Proper filtration is a must to maintain correct operation of the R-820 Series. Airtrol Components Inc. cannot guarantee perfect “non-bleed” operation under any circumstances. Consult with an Airtrol Application Engineer for more information. The SDU-5000 can be driven using a variety of drive methods, including constant voltage, L/R, constant current (chopper) and bi-level (two voltage) drives. Airtrol’s SDB-5000 series L/R drive board offers a simple an inexpensive interface to any digital signal source. For more demanding applications, a bi-level or chopper drive is recommended. A bi-level drive is also recommended for high speed applications where a frequency ramp is not being used to accelerate the motor. This will allow pressure changes to be made at an increased power setting, after which the power can be reduced to an “idle” setting to prevent over heating. 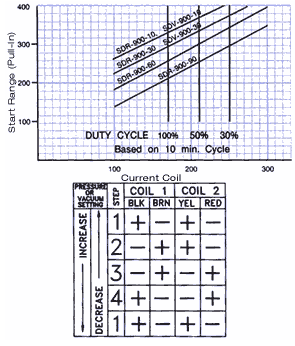 The figure to the right shows recommended fixed frequencies for various current levels. Note that the current levels above 170 mA/coil, a duty cycle must be observed (based on a 10 min. cycle). The truth table shown to the right defines the step sequence/direction relationship for the SDU-5000 Stepper Drive Unit.